You'll be £12.99 closer to your next £10.00 credit when you purchase Walking the Somme - Second Edition. What's this? This new edition of Paul Reed's classic book Walking the Somme is an essential travelling companion for anyone visiting the Somme battlefields of 1916. His book, first published over ten years ago, is the result of a lifetime's research into the battle and the landscape over which it was fought. From Gommecourt, Serre, Beaumont-Hamel and Thiepval to Montauban, High Wood, Delville Wood and Flers, he guides the walker across the major sites associated with the fighting. These are now features of the peaceful Somme countryside. In total there are 16 walks, including a new one tracing the operations around Mametz Wood, and all the original walks have been fully revised and brought up to date. Walking the Somme brings the visitor not only to the places where the armies clashed but to the landscape of monuments, cemeteries and villages that make the Somme battlefield so moving to explore. The mere fact that in this throwaway, low-attention span age, this book has already been re-printed twice since 2011, tells you something about its merits even before you are past the title page. 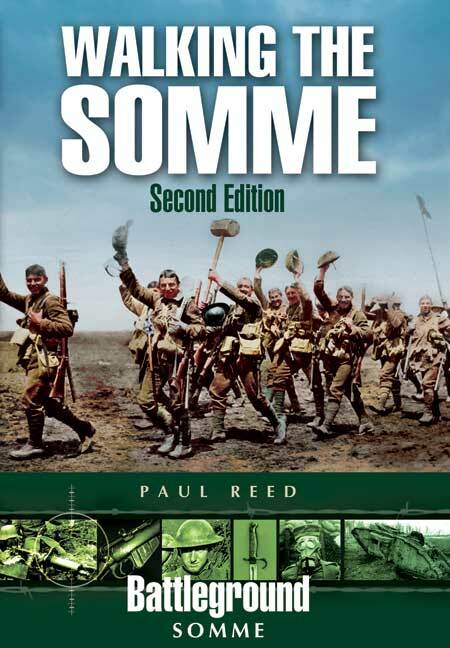 Paul Reed is an authoritative and respected military historian, passionate enough about the Somme to have made his home there, and knowledgeable enough about the area to have written this superb guide. I get the feeling that he has probably tramped through the 16 walks in this book many, many times and I would think that this guide, handy enough to stuff into a waxed Barbour, could be as essential as walking boots, a compass and a hat. Best of all, for me, is the fact that these walks are all circular. Park your car at Authuille Military cemetery perhaps, take in Blighty Valley cemetery, Lonsdale Cemetery, Lutyens's marvellous memorial to the missing, and then back to Authuille by way of Connaught Cemetery, Mill Road Cemetery and Ulster Tower. Indeed I'm quite taken by this particular walk and may well put this to the test when I'm in France in a few weeks' time. Each walk describes the area as it is now, and as it was during the First World War, and there is a handy section at the end of each walk which suggests further reading. Thus, if I had a Kindle, I would probably also take Frank Coppard, F PCrozier, Charles Douie and others with me on the walk. I don't though, and the books are too heavy to carry. (Note to Father Christmas, please leave Kindle this year). This is a greatly revised second edition of one of the earliest battlefield walking guides and covers the British parts of the Somme battlefield. The book is divided into sixteen walks, ranging in length from three to ten miles. Almost every page is illustrated in some way, with a mix of contemporary photographs, trench maps, and some modern photographs. There is also a section of modern colour photographs that give an idea of what the area looks like on a beautiful summer day. The text is well written and the author's knowledge of the battlefield shines through. The pictures are very varied and include many types of picture that I hadn’t seen before, including some sobering pictures of the earliest war cemeteries as they were immediately after the war and a genuine picture of one of the Somme attacks (tiny dots in a ragged line advancing across the landscape). This is a superb battlefield guide, benefiting both from the author's clear knowledge of the battlefield and from being a single volume covering the entire area. Part of the superb Battleground series, this excellent work is becoming something of a classic, now into its second edition printing. The book covers Gommecourt, Serre, Beaumont-Hamel and Thiepval to Mountauban, High Wood, Delville Wood and Flers. There are 16 fascinating walks described with all the information and historical accounts. Don't visit the Somme without it.